The rank was first used in the 13th century in the Royal Navy and is today used in most services in many countries, including the Commonwealth nations and the United States. Outside the United States, warrant officers are included in the "other ranks" (OR) category, equivalent to the US "E" (enlisted) category and rank between non-commissioned officers and commissioned officers. The warrant officers in Commonwealth navies rank between chief petty officer and sub-lieutenant, in Commonwealth air forces between flight sergeant and pilot officer, and in Commonwealth armies between staff sergeant and second lieutenant. The warrant officer corps began in the nascent Royal Navy. At that time, noblemen with military experience took command of the new navy, adopting the military ranks of lieutenant and captain. These officers often had no knowledge of life on board a ship—let alone how to navigate such a vessel—and relied on the expertise of the ship's master and other seamen who tended to the technical aspects of running the ship. As cannon came into use, the officers also required gunnery experts; specialist gunners began to appear in the 16th century and also had warrant officer status. Literacy was one thing that most warrant officers had in common, and this distinguished them from the common seamen: according to the Admiralty regulations, "no person shall be appointed to any station in which he is to have charge of stores, unless he can read and write, and is sufficiently skilled in arithmetic to keep an account of them correctly". Since all warrant officers had responsibility for stores, this was enough to debar the illiterate. the purser: responsible for supplies, food and pay for the crew. By the time of the First World War, their ranks had been expanded with the adoption of modern technology in the Royal Navy to include telegraphists, electricians, shipwrights, artificer engineers, etc. Both warrant officers and commissioned warrant officers messed in the warrant officers' mess rather than the wardroom (although in ships too small to have a warrant officers' mess, they did mess in the wardroom). Warrant officers and commissioned warrant officers also carried swords, were saluted by ratings, and ranked between sub-lieutenants and midshipmen. The Australian Army has two warrant officer ranks: warrant officer class one (WO1) and warrant officer class two (WO2); the former is superior in rank to the latter. All warrant officers are addressed as "sir" or "ma'am". To gain the attention of a particular warrant officer in a group, they can be addressed as "Warrant Officer Bloggs, sir/ma'am" or by their appointment, e.g. "ASM Bloggs, sir/ma'am". Some warrant officers hold an appointment such as company sergeant major (WO2) or regimental sergeant major (WO1). The WO1 appointed to the position of Regimental Sergeant Major of the Army (RSM-A) is the most senior warrant officer in the Australian Regular Army, including the Army Reserve. The appointment of RSM-A was introduced in 1991. The rank insignia are: a crown for a WO2; the Australian Commonwealth coat of arms (changed from the Royal coat of arms in 1976) for a WO1; and the Australian Commonwealth coat of arms surrounded by a laurel wreath for the RSM-A. The Royal Australian Navy rank of warrant officer (WO) is the navy's only rank appointed by warrant and is equivalent to the army's WO1 (the equivalent of the army's WO2 rank is now chief petty officer, although previously there was no equivalent). The most senior non-commissioned member of the navy is the warrant officer appointed Warrant Officer of the Navy (WO-N). The Royal Australian Air Force rank of warrant officer (WOFF) is the air force's only rank appointed by warrant and is equivalent to both the army's WO1 and the navy's WO (the equivalent of the army's WO2 is now flight sergeant, although previously there was no equivalent). The most senior non-commissioned member is the warrant officer appointed Warrant Officer of the Air Force (WOFF-AF). In the Belgian Army and Luxembourg Army, the ranks are Adjudant, Adjudant-Chef and Adjudant-Major (or Adjudant-Majoor in Dutch). In Dutch, they are collectively known as Keuronderofficier ("elite NCOs"). Adjudant-Onderofficier is the only rank of warrant officer in the Royal Netherlands Army. A Canadian warrant officer from the Royal 22nd Regiment. In the Canadian Army and Royal Canadian Air Force, the cadre of warrant officers includes the specific ranks of warrant officer (adjudant in French), master warrant officer (adjudant-maître), and chief warrant officer (adjudant-chef). In the French Army, Air Force and Gendarmerie, the ranks of adjudant (premier maître in the navy), adjudant-chef (maître-principal in the navy), and major may be considered equivalent to Commonwealth warrant officer ranks. These ranks are senior to the rank of sergeant and junior to the rank of major. Like the officers, the adjudants are entitled to the mon before their rank, as in "mon adjudant"
In France, each corps has a colour (gold for most infantry units, artillery, the air force and engineers, or silver for most cavalry units and materiel). A French adjutant wears a band, with thin red line, in the opposite colour to that of his corps. 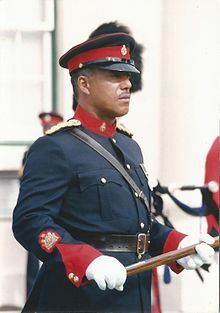 A chief adjutant wears a band, with thin red line, in the colour of his corps. In order to distinguish an adjutant from a chief adjutant it is necessary to know the arm's colour. This is important because cavalry adjudants-chefs are addressed by tradition as "lieutenants". In the Indonesian Armed Forces, there are two warrant officer ranks known as pembantu letnan (assistant lieutenant). These are warrant officer 2nd class (pelda) and warrant officer 1st class (peltu). Junior commissioned officers are the Indian Armed Forces equivalent of warrant officer ranks. Those in the Indian Air Force actually use the ranks of junior warrant officer, warrant officer and master warrant officer. In the British Indian Army, warrant officer ranks existed but were restricted to British personnel, mostly in specialist appointments such as conductor and sub-conductor. Unlike in the British Army, although these appointments were warranted, the appointment and rank continued to be the same and the actual rank of warrant officer was never created. Indian equivalents were viceroy's commissioned officers. The New Zealand Army usage is similar to that of the Australian Army, except that it has two warrant officer ranks. The warrant officer class 2 (WO2), addressed as "sergeant major", and the warrant officer class 1 (WO1), addressed as "sir" or "ma'am". There are also appointments such as company and squadron sergeant major (CSM and SSM) which are usually WO2 positions and regimental sergeant major (RSM), which are usually WO1 positions. The highest ranking WO1 holds the position of Sergeant Major of the Army (SMA). In certain uniforms, WO2s wear black shoes, the same as the enlisted ranks, whilst WO1s wear brown shoes, in common with commissioned officers. The exception to this are WO1s of the Royal New Zealand Armoured Corps (RNZAC), who wear black shoes. The Royal New Zealand Navy has a single warrant officer rank, addressed as "sir" or "ma'am". This rank is equivalent to the Army WO1. The Royal New Zealand Air Force also has a single warrant officer rank, equivalent to the Navy warrant officer, and the Army warrant officer class 1 (WO1). A warrant officer in the RNZAF is addressed as "sir" or "ma'am". Previously an aircrew warrant officer was known as master aircrew; however this rank and designation is no longer used. The RNZAF also has a post of Warrant Officer of the Air Force, the most senior warrant officer position in the RNZAF. The rank of warrant officer is the highest rank a Boys' Brigade boy can attain in secondary school. The rank of warrant officer is given to selected non-commissioned officers in National Civil Defence Cadet Corps units. It is above the rank of staff sergeant, and below the rank of cadet lieutenant. It is the highest rank a cadet can attain in the NCDCC while they are in secondary school. The rank insignia is one point-up chevron, a Singapore coat of arms, and a garland below. Warrant officers used to have their own mess. For smaller camps, this mess are combined with the officers' mess as a combined mess for better camaraderie. Warrant officers have similar responsibilities to commissioned officers. Warrant officers are usually addressed as "sir" by the other ranks or as "warrant (surname)". They are also usually addressed "encik" ("mister" in Malay language) by commissioned officers. Warrant officers are not saluted. In the Singapore Civil Defence Force, there are two warrant officer ranks. These ranks are (in order of ascending seniority): 2nd warrant officer and 1st warrant officer. In the South African National Defence Force, a warrant officer (WO) is set apart from those who hold a non-commissioned officer (NCO) rank. Warrant officers hold a warrant of appointment endorsed by the Minister of Defence. Warrant officers hold very specific powers, which are set out in the Defence Act and the Military Defence Supplementary Measures Act. Before 2008, there were two classes - warrant officer class 1 and 2. A warrant officer class 1 could be appointed to positions such as regimental sergeant major, formation sergeant major or Sergeant Major of the Army or Warrant Officer of the Navy. In 2008, five new warrant officer ranks were introduced above warrant officer class 1: senior warrant officer (SWO), master warrant officer (MWO), chief warrant officer (CWO), senior chief warrant officer (SCWO) and master chief warrant officer (MCWO). In 1973, warrant officers reappeared in the Royal Navy, but these appointments followed the army model, with the new warrant officers being ratings rather than officers. They were initially known as fleet chief petty officers (FCPOs), but were renamed warrant officers in the 1980s. They rank with warrant officers class one in the British Army and Royal Marines and with warrant officers in the Royal Air Force. There are executive warrant officers for commands and ships. Five branches (surface ships, submarines, Royal Marines, Fleet Air Arm, and Maritime Reserves) each have a command warrant officer. The senior RN WO is the Warrant Officer of the Naval Service. In the British Army, there are two warrant ranks, warrant officer class two (WO2) and warrant officer class one (WO1), the latter being the senior of the two. These ranks were previously abbreviated as WOII and WOI (using Roman instead of Arabic numerals). "Warrant officer first class" or "second class" is incorrect. The rank immediately below WO2 is staff sergeant (or colour sergeant). From 1938 to 1940 there was a WOIII platoon sergeant major rank. Before 1879, the Royal Marines had no warrant officers: by the end of 1881, the Royal Marines had given warrant rank to their sergeant-majors and some other senior non-commissioned officers, in a similar fashion to the army. When the army introduced the ranks of warrant officer class I and class II in 1915, the Royal Marines did the same shortly after. From February 1920, Royal Marines warrant officers class I (renamed warrant officers) were given the same status as Royal Navy warrant officers and the rank of warrant officer class II was abolished in the Royal Marines, with no further promotions to this rank. The marines had introduced warrant officers equivalent in status to the Royal Navy's from 1910 with the Royal Marines gunner (originally titled gunnery sergeant-major), equivalent to the navy's warrant rank of gunner. Development of these ranks closely paralleled that of their naval counterparts: as in the Royal Navy, by the Second World War there were warrant officers and commissioned warrant officers (e.g. staff sergeant majors, commissioned staff sergeant majors, Royal Marines gunners, commissioned Royal Marines gunners, etc). As officers, they were saluted by junior ranks in the Royal Marines and the army. These all became (commissioned) branch officer ranks in 1949, and special duties officer ranks in 1956. These ranks would return in 1972, this time similar to their army counterparts, and not as the RN did before. The most senior Royal Marines warrant officer is the Corps Regimental Sergeant Major. Unlike the RN proper (since 2014), it retains both WO ranks. In the United States Armed Forces, a warrant officer (grade W-1 to W-5) is ranked as an officer above the senior-most enlisted ranks, as well as officer cadets and officer candidates, but below the officer grade of O‑1 (NATO: OF‑1). Warrant officers are highly skilled, single-track specialty officers, and while the ranks are authorized by Congress, each branch of the military selects, manages, and utilizes warrant officers in slightly different ways. For appointment to warrant officer (W-1), normally a warrant is approved by the service secretary of the respective branch of service. However, appointment to this rank can come via commission by the President, but this is more uncommon. For the chief warrant officer ranks (CW‑2 to CW‑5), these warrant officers are commissioned by the President. Both warrant officers and chief warrant officers take the same oath of office as regular commissioned officers (O-1 to O-10). A small number of warrant officers command detachments, units, activities, vessels, aircraft, and armored vehicles, as well as lead, coach, train, and counsel subordinates. However, the warrant officer's primary task is to serve as a technical expert, providing valuable skills, guidance, and expertise to commanders and organizations in their particular field. The U.S. Army utilizes warrant officers heavily and separates them into two types: Aviators and technical. Army aviation warrant officers pilot both rotary-wing and fixed wing aircraft and represent the largest group of Army warrant officers. Technical warrant officers in the Army specialize in a single branch technical area such as intelligence, sustainment, supply, military police, or special forces; and provide advice and support to commanders. For example, a military police officer and a military intelligence officer both have to be branch qualified in their respective fields, learning how to manage the entire spectrum of their profession. However, within those broad fields warrant officers include such specialists as CID Special Agents (a very specific track within the military police) and Counterintelligence Special Agents (a very specific track within military intelligence). These technical warrant officers allow for a soldier with subject matter expertise (like non-commissioned officers), but with the authority of a commissioned officer. Both technical and aviation warrant officers go through initial qualification training at the Army Warrant Officer Candidate School (WOCS), but then follow separate training and education paths. Technical warrant officers are generally selected from the non-commissioned officer ranks (typically E-6 through E-9). Aviation warrant officers are able to apply from all branches of service, as well as before becoming non-commissioned officers, and some even earlier (these types of aviation warrant officers join through the Warrant Officer Flight Training Program). The U.S. Navy and U.S. Coast Guard discontinued the grade of W-1 in 1975, appointing and commissioning all new entrants as chief warrant officer two (pay grade W-2, with rank abbreviation of CWO2). This was to prevent a pay decrease that an entrant may take since all Navy chief warrant officers are selected strictly from the chief petty officer pay grades (E-7 through E-9). The Coast Guard allows E-6 personnel to apply for chief warrant officer rank, but only after they have displayed their technical ability by earning a placement in the top 50% on the annual eligibility list for advancement to E-7. In 2018, the U.S. Navy expanded the warrant program, re-implementing the W-1 pay grade for cyber warrant officers and accepting three new WO1s in fiscal year 2019. The U.S. Maritime Service, which is established at 46 U.S. Code § 51701, falls under the authority of the Maritime Administration of the Department of Transportation and is authorized to appoint warrant officers. In accordance with 46 U.S. Code § 51701, the USMS rank structure must be the same as that of the U.S. Coast Guard while uniforms worn are those of the U.S. Navy with distinctive USMS insignia and devices. The USMS has appointed warrant officers, of various specialty fields, during and after World War II. Warrant officer rank is also occasionally used in law enforcement agencies to grant status and pay to certain senior specialist officers who are not in command, such as senior technicians or helicopter pilots. As in the armed forces, they rank above sergeants, but below lieutenants. For example, the North Carolina State Highway Patrol had several warrant officer helicopter pilot positions from the 1960s until the mid-1980s. The WO insignia was a silver bar with a black square in the center. The WO ranks were abolished when the aviation program expanded and nearly twenty trooper pilot positions were created. The New York State Police rank of technical lieutenant is similar to a warrant officer rank insofar as it is used to grant commissioned officer authority to non-commissioned officers with extensive technical expertise. ^ Welsh, David R. (2006). Warrant: The Legacy of Leadership as a Warrant Officer. Nashville, Tennessee: Turner Publishing Company. p.��6. ISBN 978-1-59652-053-0. ^ a b c d e "A Brief History of Warrant Rank in the Royal Navy". Naval-History.Net. Retrieved 7 April 2010. ^ a b Lavery, Brian (1989). Nelson's Navy: The Ships, Men and Organization. Annapolis, Md: Naval Institute Press. p. 100. ISBN 0-87021-258-3. ^ a b "Information sheet no 096: Naval Ranks" (PDF). National Museum of the Royal Navy. Archived from the original (PDF) on 23 September 2015. ^ "Australian Defence Force Badges of Rank and Special Insignia". Australian Government, Department of Defence. Retrieved 19 March 2007. ^ a b c "Defence Force Regulations 1952". Australian Government, ComLaw. Retrieved 4 June 2012. ^ Major is the senior NCO rank in the French military, shortened from sergeant-major. ^ Mon is in fact shortened from monsieur, similar to the "sir" in Anglo-Saxon military tradition. ^ a b MINDEF, History Snippets, 1992 - The SAF Warrant Officer School, 7 January 2007. Accessed 19 March 2007. ^ "CMPB | Ranks and drill commands". Central Manpower Base (CMPB). Retrieved 26 November 2018. ^ "Minister approves new ranks for Warrant Officers" (PDF). South African Soldier. SA Department of Defence. September 2008. p. 17. ^ "Warrant Officer in a class of his own". Royal Navy: News and Events. 24 April 2013. ^ "New Base Warrant Officer at Culdrose". Fleet Air Arm Officers Association News. 2 October 2013. ^ "201401 Navy News Jan 14". content.yudu.com. Retrieved 26 November 2018. ^ Banham, Tony (2006). The Sinking of the Lisbon Maru: Britain's Forgotten Wartime Tragedy. Hong Kong University Press. p. 272. ISBN 9789622097711. ^ Jones, Bruce (1 February 2015). "CGS outlines new British Army senior posts amid culling of generals". IHS Jane's Defence Weekly. ^ "NAVY—THE ROYAL MARINES—SER GEANTS.—QUESTION. (Hansard, 29 July 1879)". hansard.millbanksystems.com. Retrieved 1 August 2017. ^ "London Gazette, 2 December 1881". Retrieved 1 August 2017. ^ "London Gazette, 12 November 1915". Retrieved 1 August 2017. ^ "The London Gazette, 3 February 1920". Retrieved 9 April 2010. ^ "London Gazette, 15 November 1910". Archived from the original on 3 September 2010. Retrieved 1 August 2017. ^ "London Gazette, 15 June 1917". Retrieved 1 August 2017. ^ a b "Warrant Officer History". U.S. Army Warrant Officer Career Center. Archived from the original on 24 June 2007. Retrieved 18 March 2007. ^ 46 U.S. Code § 51701 (c) Ranks, Grades, and Ratings.— The ranks, grades, and ratings for personnel of the Service shall be the same as those prescribed for personnel of the Coast Guard. ^ "United States Maritime Service Insignia of Rank and Distinctive Devices and Uniforms". www.usmm.org. Retrieved 1 August 2017.